Get in on the mayhem now. Due to the high cost of operating in Australia. Lady Hammerlock Pack gets a launch trailer. The final piece of DLC is a campaign set inside Claptrap’s mind. Fixes issues and adds content. Both will be added with the next free update. Get ready for a level cap raise. Save data will now save correctly when two split-screen players choose the same character. 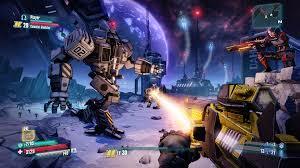 And you can play as Claptrap. Get your arse to the moon. They’re focusing on the PS3 and Xbox 360 versions right now though. Before the sequel; before the review; there was the pre-sequel preview. Shoot monsters on the moon! Find out when.